I like a lot of folk music but I’d not heard of any of the weekend’s performers apart from North Sea Gas. So would I be won over by any of them? Well yes. and sadly, no. 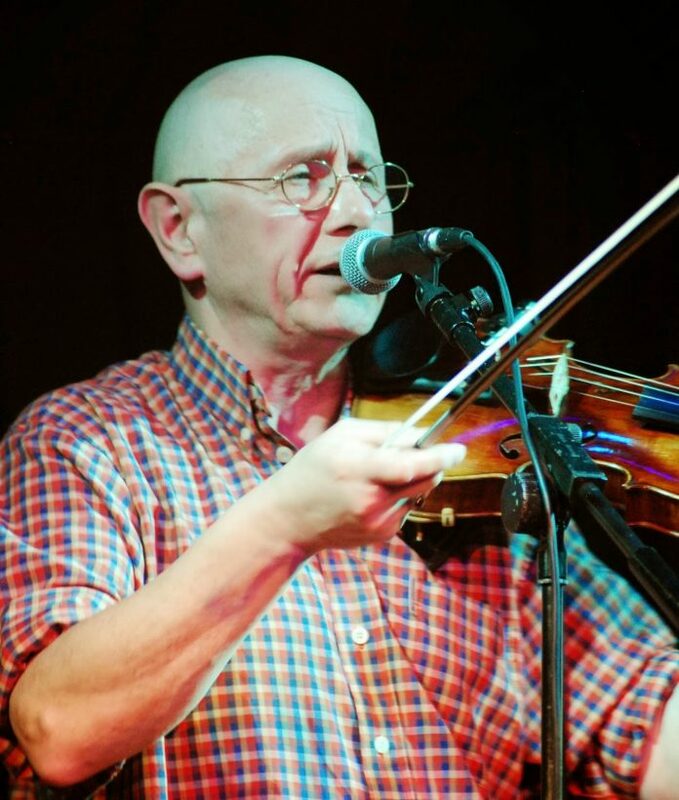 It was with a fair amount of trepidation that I arrived at the Square Chapel to see Tom McConville, I’ve never been a huge fan of ‘fiddle-based folk music’ so winning me over was going to be a tough call to be honest. I’m going to say right upfront that I’m a convert. A small but enthusiastic audience welcomed Tom and guitarist Chris Newman onto the Square Chapel stage. He explained that unfortunately the billed clog dancers, weren’t able to make it because of extreme weather, and that for this concert he’d be accompanied by Chris Newman. Before I go on I’ve just got to say that the obvious musical rapport between Tom and Chris was a treat. Tom plays and sings a wide range of ‘folk music’, from Scottish and Irish pieces to bluegrass and hornpipes. He has a wonderful quiet and warm manner and has a great sense of humour. His first piece was a lifting Celtic instrumental that sped up as it came to the end, and it showcased a range of fiddle techniques and tones. This was just lovely and by the end I was looking forward to the next piece. The next song – ‘Home Is Where Me Heart Lives’ I think it was called – introduced me to his voice which is equally as compelling as his fiddle playing. The song had almost a folk-pop arrangement, and yet more playing techniques were introduced. I was, to be honest, hooked at this stage. Tempting as it to just go through the whole set I’m just going to pick out a few highlights. A hornpipe that transitioned into jazz and back to the hornpipe was stunning – and made the audience smile with delight. This really showcased the rapport between Tom and Chris. There was also a moving song about ‘a girl who couldn’t be tied down’, which included a pleasing guitar ‘solo’ from Chris and ‘Listen To The Wind’, a gentle and understated song about lifelong love – this featured Tom’s gentle way of getting the audience to join in (usually using the phrase “give it a try” or “if you want…”). I really enjoyed Tom’s music and it was obvious that the rest of audience felt the same. Next time he’s in our area I’ll be in the ticket queue, and I recommend you are too. Alasdair is a singer, guitarist and songwriter who plays both his own material – which I felt was very much a contemporary take on the traditional ballad form – and interpretations of traditional ballads. He’s undoubtedly equally talented in the writing, singing and playing but for me on the night these elements seldom came together in a coherent form. I found myself in one song trying to listen to the words and in another the guitar playing. However given the rapt audience it was clear that I was in a minority. And it’s highly probable that, given enough listening to his recorded music, his live performance would work for me as well. The words are important in his own material and there are a lot of them – for me it was more like poetry. There were however some highlights for me. ‘Sweet William’, a traditional song, was a gently moving tale of a sailor’s love. And the last two songs – from the album ‘The Amber Gatherers’ – for me were more song-like in structure, and hugely effective. As I’ve already mentioned he’s an accomplished guitar player and I really enjoyed that aspect of his performance. So would I recommend him to you? Well yes if you like complex lyrics and good acoustic guitar playing and are prepared to listen to some of his work before you see him live; so you can understand his sort of music. 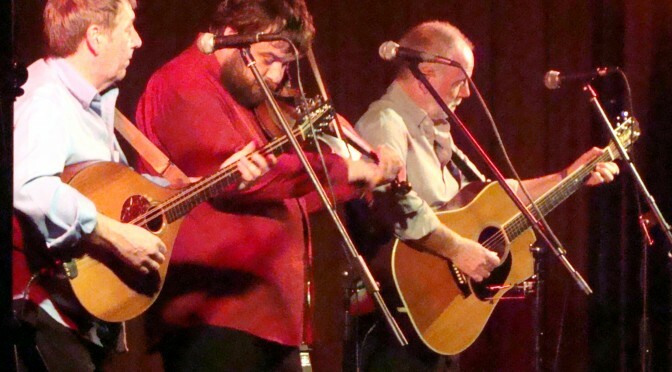 North Sea Gas are a Scottish folk band who play guitars, mandolin, fiddle, bouzouki, harmonica, whistles, bodhrans and banjo. Sadly although they are talented musicians and great singers I, unlike the rest of the audience, didn’t enjoy them that much. It wasn’t the music which I failed to enjoyed (apart from the comedy song, which was about a ‘garden hose’ … I leave the rest to your imagination) but the in-between banter which grated with me It just felt all a bit ‘scripted’ and there were rather too many mentions of the CDs being available to buy. However, there were a couple of highlights – an almost folk-rock arrangement of ‘Over The Hills And Far Away’ and ‘Fire In The Glen’, the famous Andy Stewart song. While I may not have been grabbed, the audience clearly were, and there was clapping and singing along. Given a different environment – perhaps a bar or a more conventional gig venue – rather than the Square Chapel, I may have felt differently about North Sea Gas. So there you have it – a hit, a definite maybe and sadly a miss.